We are a nice and cool bed and breakfast concept, the place is an original eclectic mix of a Mexican styles, with influence in the rustic traditional movements in the different zones like the Bajio, Center, South and Southeast of the country. The premises have been lovingly restored and revive the colonial heritage in fusion with the traditional Mexico. 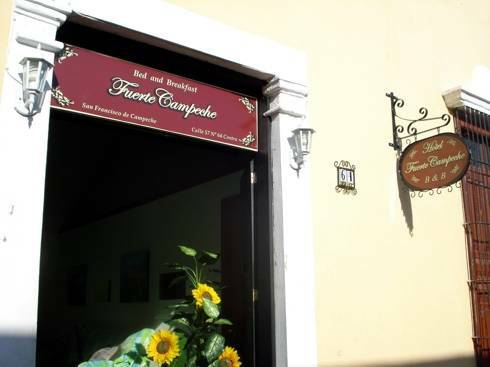 Rooms at this Campeche Mexico B&B provide guests with comfort and privacy, each room has it own character as well as a traditional decor with eclectic furnishings. As your hosts, we will be there when you need. Come enjoy the ambient, style and Mexican personality of our colorfully bed and breakfast. Fuerte Campeche is located one block from historic fort Puerta de Tierra. payments only..Any payments made are non eafundable after arrival at the B & B. Guests can cancel their reservation free of charge up to 2 days before arrival. Deposits paid are non refundable. Exit the bus station on the Av. Casa de Justicia and take a Red taxi. It will cost around MXP$ 35 (US$ 2. 50).